The corner of the blogosphere that I tend to frequent has seen some discussion directed at narrative in video games as of late. It seems to have started with the Narrative Manifesto written by Michael Abbott at The Brainy Gamer. What followed was an almost immediate response by Chris Lepine at The Artful Gamer, titled Narratives and Interactivity Still Misunderstood. This in turn prompted the additional response of Choose Your Own Lover, written by Denis at Vorpal Bunny Ranch. All of these posts have naturally also seen a great deal of commentary, and the discussion has continued from there. In short, it seems that many people are excited about the fact that narrative in games is becoming more important to many people, and enough so that creators are trying to find better ways of developing it in their games. The comments on The Brainy Gamer's Narrative Manifesto suggest that the theories are being split into two camps: player generated narrative and author controlled narrative. The new developments in technology seem to be pushing us towards the former, with player generated narrative coming to the foreground as an exciting and promising new frontier as evidenced by some of the buzz around Far Cry 2. Meanwhile, it would appear that some are all too eager to abandon authorial control as an old methodology which has outlived its usefulness. What is perhaps a more resounding consensus than what type of narrative structure games should follow, is the fact that there are just so very few games to have created a truly compelling narrative to begin with. Whether they be player generated narratives, or author created, quality just seems to be lacking altogether. On one hand you have your free-form adventure games a-la The Elder Scrolls, while on the other hand you got your Wing Commanders or Resident Evils or what-not. Those are probably some of the better examples, to say nothing of lesser fare. Whatever the case may be, there is one element of this interactivity and narrative marriage which I can't seem to get past. I'm thinking that there's trouble in paradise, and the honeymoon between these to is just starting to go sour. Like many couples, interactivity and narrative are not very often well matched, and I find myself disliking one or the other in many a game. Metaphors aside, what gets to me is when I have a truly good story in a game and it's delivery is incongruous with the game's interactive aspects. 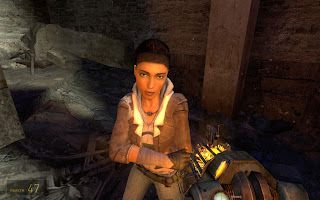 This seems to be very much in line with Jonathan Blow's thinking, referencing Half Life 2 in particular, where "the gameplay is well designed, and so is the fiction, but '...they fit together disingenuously,'" (link). That's just Half Life 2 though, and that's also Blow's position. So lets look at some other examples that I'm more familiar with. One of the best linear gameplay, authorially generated narratives out there, as far as I'm concerned, is the Wing Commander series. The best stories happen in parts II, III, and IV. Good stuff. 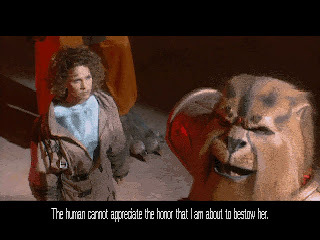 It's presented to you in the old FMV flavor of cutscenes between missions, though some exceptions occur. The straight up cutscene/action dynamic is punctuated with old-school adventure-game-style clicking interaction in a largely static environment. That helps, but what doesn't help is the action. The story in these games is fairly well written, the characters are dynamic with a good bit of depth, and yet you are continually taken away from the story by silly little space dogfights! Don't get me wrong, I miss the old space opera shooters of yore, and think the genre should come back, but the action and the story just aren't good bedfellows. I might even say that the story is too good for the game, because it makes me want more story and less space combat. Hence the whole incongruity notion. Many games that fall into the linear, author controlled narrative camp of the past tend to have this problem where I like the story and I really just want more of that. The gameplay becomes an obstacle to this, and at some point (usually towards the end) I begin to care nothing for the annoyingly difficult challenge of defeating the last bad guy. The end-game is always the hardest. Consequently it also tends to be the most annoying as a result, because game balance tends to go out the window. It has to be really hard, otherwise it would not be an "end boss." So what do I do in this case? Well, sometimes I just bite the bullet and try and try again and finally beat the sucker. Sometimes, I loose all interest in a game and just stop playing it completely (how many RPGs have I abandoned just before the end?). But sometimes, if the story is really good like it's supposed to be, I'll just cheat. I mean, to hell with it. I've suffered through the whole game, and now right when I'm about to see that fabulous ending I get stuck with this irrelevantly difficult obstacle. Get me a cheat code and I won't think twice about it. On the other hand, when you get me on a game like Diablo 2, Gothic, or Morrwind, it's really something else. Those games are certainly on the side of player generated narrative in my book. For those familiar with them, let's just be honest here and admit that when it comes to story, well there just isn't much of it there. Maybe with the exception of Gothic. That doesn't seem to bother many of us. Reasons for which are quite simple: the gameplay is good enough to stand on its own. In fact, the mechanics are so well designed that they are enough to get us hooked. I played Diablo 2 for several years, and Morrowind for about two. Gothic for a bit shorter, but between Gothic 1 and 2 I have many hours invested there as well. The fact that you can just do as you please, taken to the extreme in Morrowind, is what makes these games worth playing. However, before I get further into this, I'd like to make the important distinction between the above single player games (not counting multiplayer in Diablo 2), and similar renditions of the MMORPG variety. I have come to the realization that the presence of countless other players in a vast free-form world makes the game loose its charm for me. The magic is gone. It's gone because I'm no longer special. In all of my narcissism or egoism or whatever you might think it to be, I prefer to be the only (or at least one of very few) players in the game world. 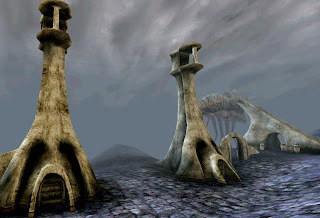 Being the only one in Morrowind makes me feel important, because it's like nobody else has been in this world before me, and I am discovering it for the first time. Nevermind how many people have played the game, the fact is that this save game file belongs to me and as such remains unique. That is an issue in itself, and I won't digress further into it here, but I did want to make it clear that I am talking about single player experiences. Now we know where we are, in a vast, open, and free-form game world, and we are the only player there. That is when it becomes all about the gameplay experience. The combat, the action, the loot hording, and obsessive leveling, and so on and so forth. The playing experience becomes its own reward, while story becomes secondary. Or at least the pre-generated story of the game. The multitude of possibilities in such a game world allows the player to generate their own stories. We can recount them on our blogs, and to our friends. That right there is narrative. Maybe not great narrative, depending on your disposition, but it counts. Alright, so it is just a silly little example (though I did actually do that). The point is that we generate our own narratives in such open-ended game worlds. We create our own quests even, and try to complete them. This is where I must applaud games which have no pretense of providing a story, and just focus on intense and solid core gameplay. These are few, but Universal Combat comes to mind. That was some of the most intense player generated narrative. Just try to learn and fly a ship in that game, I dare you. Thus far I have given some of what I consider to be prime example of either end of the spectrum. 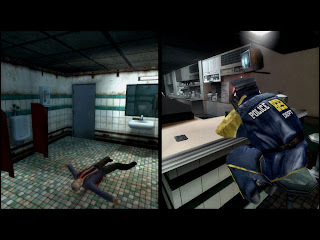 There are many games which do well in one department or the other. There are some very strong story driven games, but often times the gameplay can get in the way of enjoying those stories. There are also many good gameplay driven games, some of which provide you with a world where you can create your own stories easily and have fun doing it. Of course there are an endless barrage of gameplay driven games where there is little or no story, and the mechanics themselves aren't very compelling either, but that's something else entirely. The question now, however, seems to be whether it is possible to reconcile this broken marriage between narrative and interactivity. My answer is a resounding yes, and I know just the game that did it right. It's probably not what you might expect, but here it is: Indigo Prophecy (aka Fahrenheit). I can already hear the scoffing on the other side of the screen. Still, I think it's true. Out of all the games that I wracked my brain for, I can only think of this one where I am convinced that the balance was struck almost perfectly. I say almost, because I know the game is not without its flaws. Indigo Prophecy had some issues towards the end, but there was almost no part where I felt inconvenienced or irritated at the mechanics for keeping me from the narrative. Somehow, the narrative was woven so well into the gameplay that it worked really well. Admittedly, there is still cutscene/action structure in the game, yet it feels much more fluid than that same structural convention in many other titles. Still other sections of Indigo Prophecy present you with cutscenes and player interaction simultaneously, and that I belive is where the game is most successful. 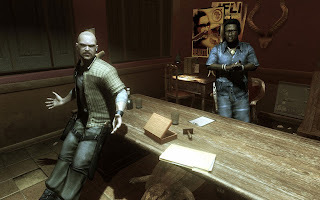 The presentation choice of juxtaposing alternate perspectives and events with the player's gameplay and reality serve to create an atmosphere that feels vibrant and important. It may be true that Indigo Prophecy is largely an author created narrative, but when it's done so effectively I too don't mind. Not to mention that it may present us with a technique from which other games can learn and benefit to strengthen their narrative elements. Bringing this already lengthy post to a close, I certainly consider myself optimistic of what is to come in the future of the gaming industry. I too believe that there is room for both types of games, and even some games that try to bridge the gap by giving us a little of both types of narrative. I have no doubt that it can be done, and I will not profess to forgo one experience in lieu of the other. I would get terribly tired of games if I only had one type of them. Sometimes I like to play games created with an authors iron grip on the story that really gets us emotionally involved. At other times, I just want to kick back and have the freedom to do whatever I like in a game. Something also tells me that most gamers out there feel this way too, and aren't obsesses with a singular type of experience. As long as that's the case, and I don't foresee a time when it won't be, there will always be room for variety in the market. Or, let us at least hope so.